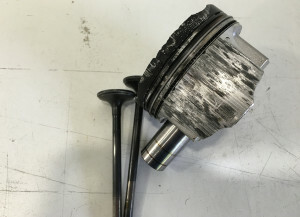 With the Dragon2000 Rally Team’s Mitsubishi Lancer Evo 6 having spent much of last season recovering from an injury sustained while rallying at the MIRA test circuit, the only way to deal with this seized piston…..
….was to indulge in this…. 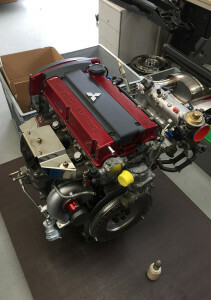 a new 2.0 litre turbo engine! We were using the same Michelin tyres as the WRC teams which look more like a summer track-day tyre than something for January. Seeing everyone else changing to wets added another layer to my nervousness, not having driven the car since May last year. So, we ventured out and, driving ‘sensibly’, we were 15th quickest from the 100 or so competitors. For me, that’s about par for the course and normally I’m likely to improve a bit over the day, although the top runners are long gone by lunchtime! How wrong could I be. Despite trying a bit harder, on Stage 3 we recorded 36th quickest time and slid down the rankings. Mike Hughes, my Co-Driver, was having an ‘off-day’ and failed to tell me to pick up the pace. Just to even things up, I proceeded to stall the car on the start line of the next stage wasting another 20 seconds fumbling around looking for the recently moved starter button. Despite not getting the times we wanted, we did still have to make an effort…..
At the same time, we were having all sorts of warnings from the dashboard telling us about low oil pressure, high air temperature and high engine temperature. All would be bad but collectively there was an air of impending doom. Each time the warning came up, I cleared it, only to be faced with another and then another. Everyone was pretty sure that there wasn’t a real mechanical problem so, in the end, I had James from David Appleby Engineering (who do a great job preparing the car), turn all the alarms off! This was much better and I could then concentrate on trying to improve our position rather than fighting the dashboard. By the end of the day, we had recovered to finish where we started – 19th. Not what I hoped for, but the positives being that the car had behaved pretty well following such a protracted rebuild. Mike and I were rusty and feeble in places but I promise to try harder at Goodwood on the Southdowns Stages in a few weeks’ time. At least we had wry smiles at the end of the day.